We won’t even pretend to be able to compare all the different tablets available today. We do have our opinions however! And, a few specific features that we think are important to travelers. We own 3 tablets, a Nexus 7, an iPad mini, and an MS Surface Pro. We highly recommend any of them, but be sure to read the section below on features and accessories. iPad and iPad mini with the iOS operating system from Apple. If you already have an iPhone, then this is probably the right tablet for you. We like the size of the mini. It’s easier to hold in your hand, and it fits in a small purse/bag … and it costs less. 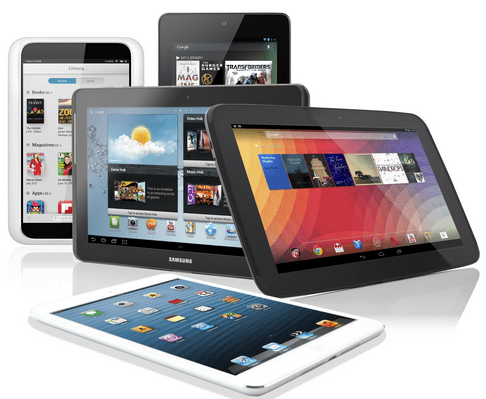 Android tablets like Nexus, Samsung, and countless others. We have the Nexus 7 and think it is the most bang for the buck. The Samsung is currently the most popular brand. Kindle Fire HD and HDX. Although this is based on the Android operating system, it needs a category of its own because it is highly customized by Amazon. You can only download Apps from the Amazon store and that does not include Google Maps or Gmail. The HDX is the one with the nifty “Mayday” feature where a live person appears on your screen and can help with anything about your tablet. FYI you don’t need a Kindle to read Kindle books. All of these devices have Kindle reader apps. Windows 8.1 tablets like the Microsoft Surface Pro or Surface RT and many others starting to hit the market. – Windows 8.1 Pro means a true Windows 8 computer that can run all existing windows software like Picasa, Quickbooks, Turbotax etc. – Windows 8.1 RT can only run the new software specifically written for it – this includes Word, Excel, and Powerpoint – but not Picasa or Quickbooks or Turbotax. There are a few features that we think are important to travelers and are not always highlighted in the description of the tablets. You will need to ask to be sure the model you’re looking at has these features. 3G/4G capable in addition to Wi-Fi. Lots of people who buy tablets use them just for the couch at home, that means they always have their home Wi-Fi to provide the Internet connection. If you travel a lot, you may not always have a Wi-Fi connection available, so being able to connect to a cellular provider can be extremely convenient. This adds to the cost of the device, and also a monthly bill to a cellular provider. With our iPad mini, we bought the cellular model and we can turn the $30/month service on and off as needed. GPS Receiver: The tablet size can be great for a GPS navigation tool, but not all tablets have the necessary GPS built in. We learned the hard way with our first iPad; we tried to save a little money by buying the Wi-Fi only model just to discover that it did not have a GPS. Our second iPad we made sure to get the 3G/4G version so it also included GPS. Front AND REAR Camera: Lots of tablets only have the camera that faces the user. This camera is used when you’re making a video call like on Skype. Even the couch potatoes want that, but travelers like to take pictures too! For that, you need a Rear-facing camera. Bluetooth: Bluetooth is the capability to connect to other devices nearby like a keyboard attachment, or your dashboard radio. We use this all the time to play music from our device but have the sound come out of the RV radio speakers. Now, not all vehicle radios have Bluetooth capability, but if yours does, this is a great way to play music, or to hear the GPS Navigation instructions. I would expect all tablets $400+ will have Bluetooth, but not so with the less expensive models. We know that many of you are confused now, and you just want us to tell you what to buy. OK, here it is: the Google Nexus 7 (2d generation) has everything at the best price. It has 4G available as an option, it has built in GPS, Front and Rear camera, and Bluetooth. It’s available at Amazon, Best Buy, and at AT&T or T-Mobile. There are different models, be sure to specify all the features you want. I can’t think of any other piece of technology equipment that I’ve enjoyed as much as the Logitech Ultrathin Keyboard/Cover for the iPad and iPad mini. I even wrote about it once before in: iPad as Work Computer. It is just so elegant, and so useful. I love how it makes my iPad sit up just like a laptop and the touch of the keys makes typing a great experience. And it is so simple to set up, just pick up the iPad and place the bottom edge in the slot. A magnetic groove holds iPad upright at the ideal angle for typing and interacting with the touch screen. When you’re done, just pick it up and lay it flat on top of the keyboard, a magnetic flap will grab on and keep it safe. We used to have a folio cover that enclosed the iPad in a notebook with a keyboard. That was SO much clumsier than this, the keyboard was almost useless for touch typing, and the closed package would never fit in my little purse. 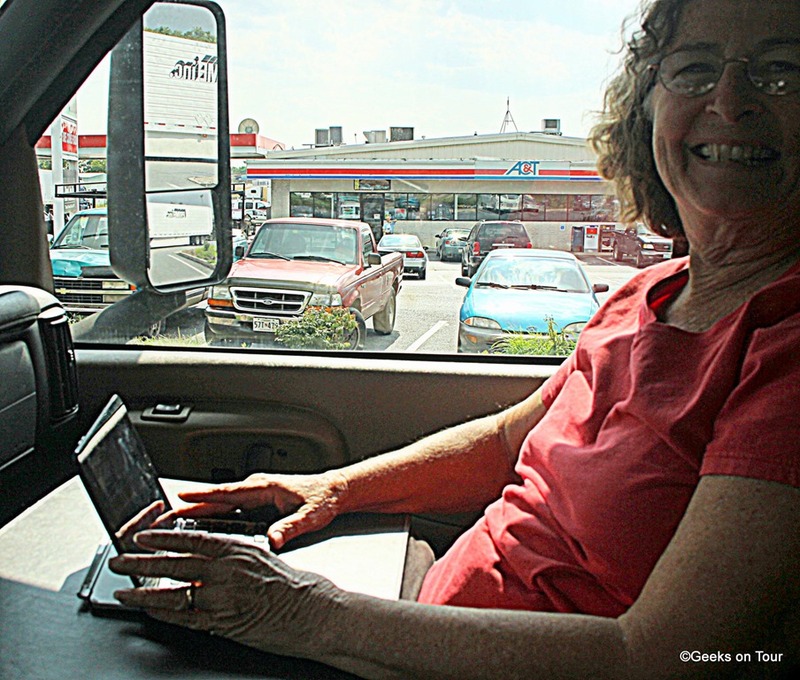 Here I am in the passenger seat using the iPad mini just like a laptop. Published by MrsGeek, in Blog. Tagged with Tablet computers. A week ago in the tablet forum I wrote abou how I use my Samsung Galaxy tab 10.2. The tablet has google map and I use quite a bit. It is good when you get into a town to find specific locations and the area around. I like to plot out a walking route and take my phone with the Field Trip app and go. 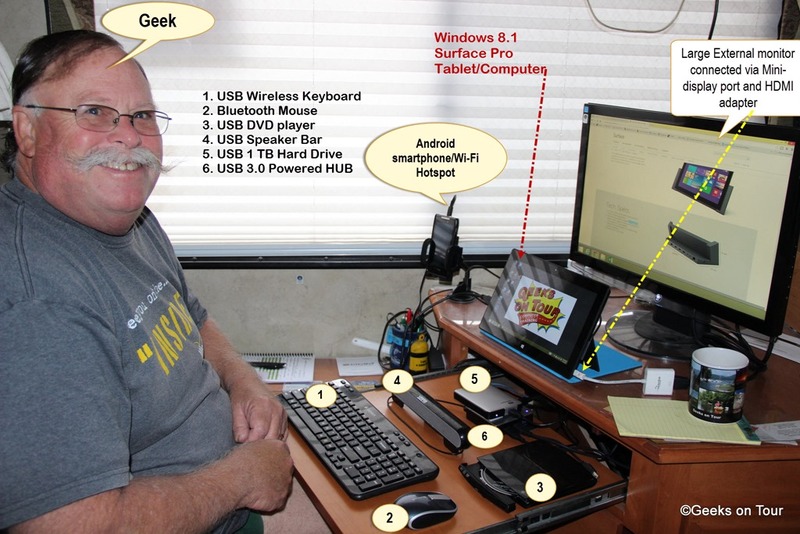 I have a wifi tablet and use it with my Verizon cell phone hot spot. There is no charge for the hot spot.